If your hose is kinking repeatedly in one particular spot, there is no need to replace the entire hose. Or maybe your hose is leaking badly and is causing a mess at one of the ends. Again, there is no need to replace the entire hose. Instead we would recommend putting a new coupler on the end, and you will be as good as new! This process is quick and easy for anyone to accomplish and it only takes a couple simple tools (a screwdriver and a utility knife) to complete. If your hose is leaking somewhere in the middle (not near an end), you will want to cut out this compromised section of the hose. This could be an area with a hole or even an area that kinks repeatedly. Stop in for one of our hose menders and we would be glad to demonstrate how they are installed. If you hose is leaking at one of the fittings, it is likely that the threads, washer or the overall shape has been compromised. This is an easy fix with just a $3-$7 dollar part and a few minutes of time. You will want to cut off the bad end and install the new hose coupler! Just like that, you will be as good as new once again. 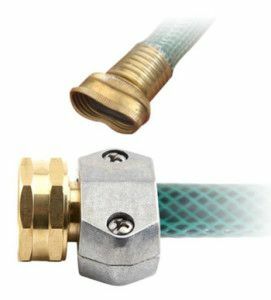 These are a great quick fix to any garden hose that is suffering from a leaky hose fitting, especially so if your hose is of high quality and perfectly good in every other way.